A native of San Francisco, Bob Mills served in the Navy after high school, graduating from San Francisco State University in 1962 and the University of California Hastings Law in 1965. He practiced in Palo Alto, CA for ten years before moving to Hollywood to write for television. 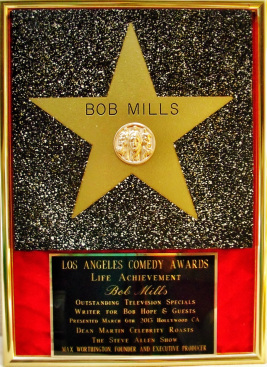 He worked on the "Dinah Shore Show," the "Steve Allen Show" and the "Dean Martin Celebrity Roasts" before joining Bob Hope as a staff writer in 1977. He traveled the world with Hope for the next seventeen years. From 1992 to 1996, he co-wrote a daily topical humor column for the Los Angeles Times called Laugh Lines. In 1973, he married his wife, Shelley, with whom he lives in Studio City, California. He is a volunteer reader at Recording for the Blind and Dyslexic in Hollywood and is a fill-in host on "ACCESS UNLIMITED" on KPFK 90.7fm Los Angeles, 98.7fm Santa Barbara. The hour-long program addresses issues of interest to the disabled. He is an emeritus member of the Writers Guild of America and holds memberships in two professional organizations -- Yarmy’s Army, a group of veteran writers and entertainers who meet monthly for dinner and produce fund-raisers for worthy causes -- and The Pacific Pioneer Broadcasters, a social club made up of former radio and television professionals founded by Edgar Bergen and Jim “Fibber MaGee” Jordan.